Leg 6: Dibba to Mussanah ~ Youngest teams shine! Rising Tide Leadership Institute Ambassador Dee Caffari, a veteran of past events, shared thoughts before Leg 6: “It is usually quite eventful with quite a mixture of weather.” Enroute there is a ‘ship graveyard’ the boats will sail past. In the last race the start was windy but then the wind dropped off to nothing, and the boats had to motor for 35 miles. “Fortunately I don’t think we’ll have any of that this time,” advises Caffari of the big conditions. Like several of the other girls in Caffari’s crew, Al-Salmi is expecting to be heading for France this year from March until July to compete aboard a J/80 yacht, with a program culminating in the J/80 World Championship. 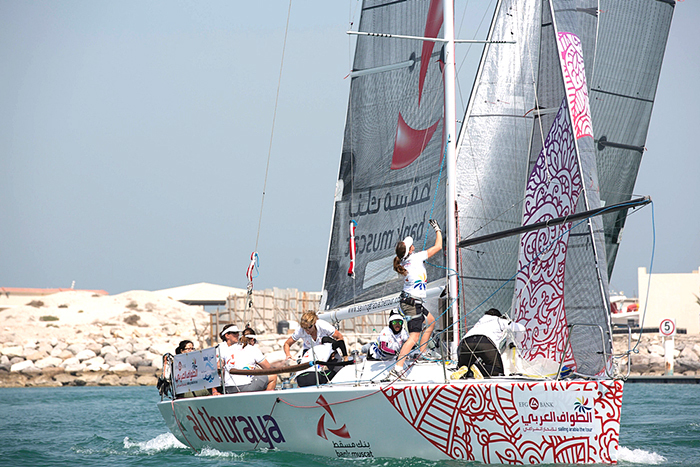 Al-Salmi says that she likes inshore and offshore racing equally. 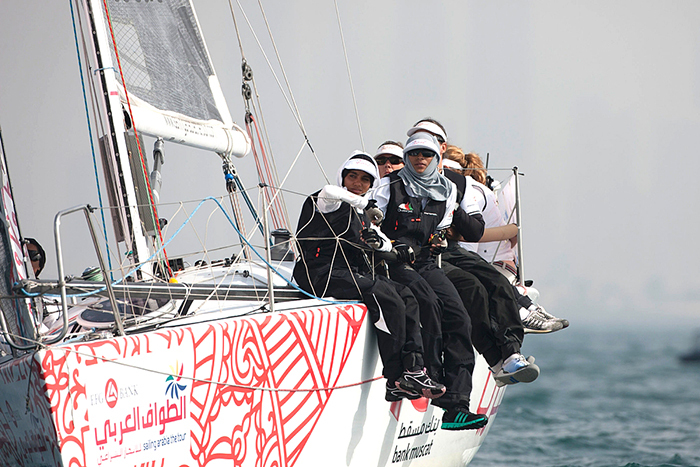 “My ambition is to be a good sailor, and to know the boat, and everything going on it, so that when they put me in each place in the boat I can know what to do.” ~ Oman Women’s Sailing Team, placed a respectable 7th in Leg 6. A stunning victory for the Dutch boys! Dutch Student Team Delft Challenge -TU Delft pulled off a stunning victory in today’s leg of the Gulf region’s only long distance offshore sailing race, finishing over an hour ahead of the nearest rival! 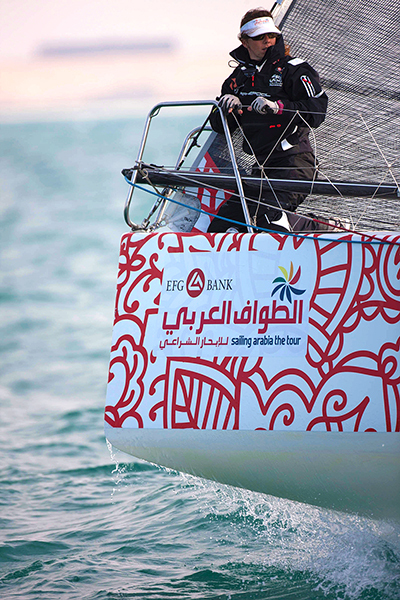 All the boats competing in EFG Bank Sailing Arabia The Tour are Farr 30 one designs, identical boats of identical speed, and under normal circumstances in an offshore leg the boats are separated by minutes, if not seconds. 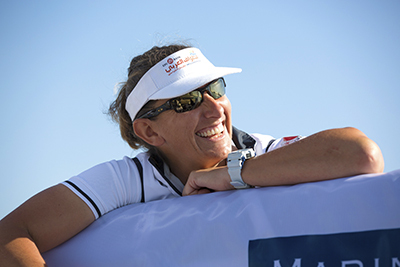 However on the sixth leg of the event from Zighy Bay to Mussanah Marina, the leading boat, TU Delft, arrived one hour and 12 minutes ahead of her rivals. The sixth leg should have been plain sailing for the leading three teams, but Delft took a risky tactic of splitting from the rest of the fleet, and heading inshore in the early hours of the morning. The Dutch student team, at one point, was ahead by more than 10 miles – impressive, on a leg that ended up being less than 60 miles from start to finish, after it was shortened. and with, some of the greatest sailors in the world! 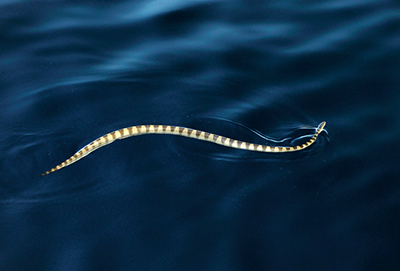 Great sailing, rugged beauty… and did I mention sea snakes? Our stopover at Six Senses Resort, Zighy Bay, has been an amazing slice of heaven, and a much-needed rejuvenation. The resort is beautiful, serene and eco-friendly. I highly recommend it, and will definitely be visiting their resorts in the future! Leg 5 was long, and sometimes painful, but we made it after nearly two days and one night. This leg includes the internationally famous Strait of Hormuz. The start, leaving Ras Al Khaimah (RAK), was a nightmare. Two of our passports had been incorrectly stamped somewhere in the process, which when we went to leave, caused an 8 hour delay! The Race Committee had arranged for an early morning start – so we were up at 5:00 am – only to wait, and wait, and wait until 2:00 pm to finally leave the dock. Really frustrating. It was upwind the coast of UAE in a good, but quickly clocking and dying breeze. Early in the night we were on spinnakers heading up to the top. Going through the strait in the dark (again), under spinnaker through a little hole and sheer cliffs, allowed us to not have to circumvent the strait entirely on the outside. Once we popped through to the other side of the gulf, the wind died for all competitors. It was a restart, with all of us floating around. Luckily for us, we were positioned in on the shore, and were able to grab some zephers and move along with a couple of other boats. Others were not so lucky, and hung around for hours before they could move. At one stage we were in 2nd! The wind was fickle, however. Although we were moving, EFG Bank grabbed another piece of wind, and were able to sneak by us – knocking us off the podium. Argggh! But being fourth was a great move up for the team, and the girls were very happy. 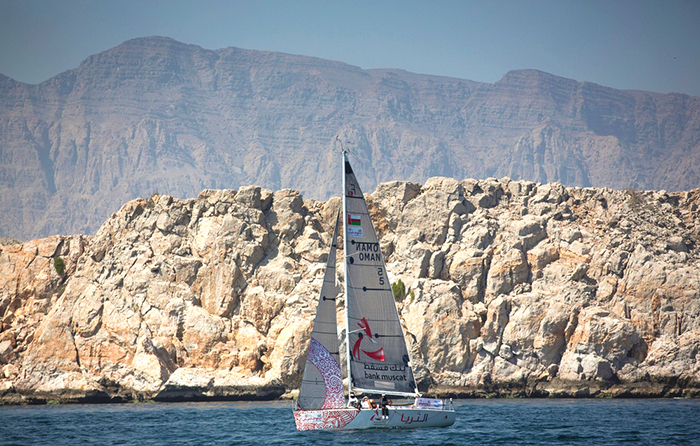 Today, we leave on a very long leg to Mussanah, Oman, which is where the training facility of Oman Sail Keelboat Teams is located, and essentially has been home to the girls. Their friends, and old instructors will be there. It will be quick, as we finish in the afternoon, and then leave the next day for the final leg into Muscat. It has been such a good journey for the girls thus far. There is much to reflect upon, but they have really taken it on. Yesterday’s in-port race in Zighy Bay utilized the full Omani crew, with coach Niall and Dee onboard. 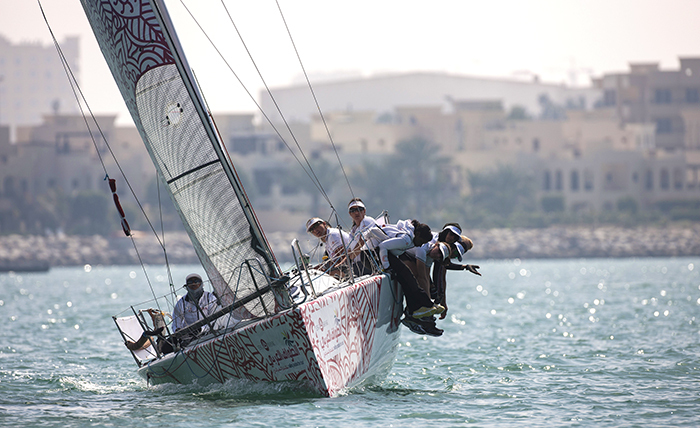 The race was not counted, but it allowed our Omani girls to do it all, and own it. A good experience – although Tahira told me later, that she missed having the coaches onboard, and wanted us back on – pronto! Here’s hoping to keeping the wind today, and tonight! Leg 5 ~ Our ladies place 4th! The fifth leg of Sailing Arabia The Tour saw the eight competing Farr 30 one designs set sail from Al Hamra in Ras Al Khaimah, bound for Zighy Bay in Oman ~ via the Strait of Hormuz, and past the most visually spectacular part of the race course… the flat desert giving way to the mountainous Musandam Peninsula. The 24 hour long leg was a tense game of snakes and ladders for the majority of the competitors. Only AISM consistently performed well, leading for the majority of the leg. Bertrand Pace and the crew of AISM have won their fourth consecutive offshore leg of the tour. Some, including Cedric Pouligny-steered BAE Systems, lying in second place overall, got stuck along the course and found themselves racing among the backmarkers. For others the most tactically tricky leg to date worked in their favor, with Kay Heemskerk’s Delft Challenge – TU Delft scoring their best result of the whole race, coming home in second place. What a whirlwind it has been, adding Dubai as a pit stop, into the mix of Sailing Arabia The Tour. A day of rest was taken from the Ras Al Khaimah (RAK), UAE, stopover, so that the fleet could do a quick jaunt to the city. If going into Doha, Qatar, at night reminds one of Las Vegas, then going into Dubai at night is like going to Disney’s Magic Kingdom. Amazing buildings, and skyline… We stayed at the Holiday Inn Express – a brief taste of home! The Omani girls have been making solid progress, but like all progress it is a couple steps forward, and a couple steps back. This especially occurs when they are tired. 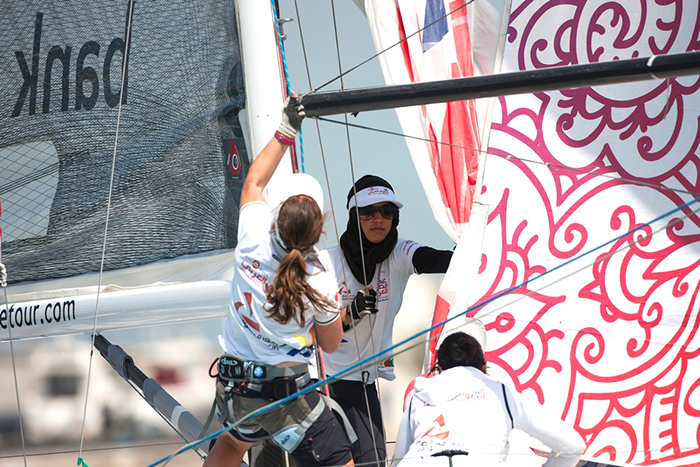 In the in-port race at Abu Dhabi, the girls racing were on fire. They were trimming, attentive, the kite went up and down smoothly (for the most part), and we had a good result. However, a race like this is an endurance race, so our long nights and early mornings were especially telling by their exhaustion. They are not used to it, and its hard to train for. With prize giving, and lunch in the sun, the girls were pretty tired that night. Because of the added pit stop in Dubai, and a well thought out desire to finish in daylight or early evening, the start the next morning from Abu Dhabi was breakfast at 4:00 am, bus at 4:30/5:00 am, and off the dock at 6:00 am. In our debrief, prior to the leg to Dubai, we discussed that it takes some time to ‘get going’ in the mornings. Because of this, we told the girls to be on the 4:30 am bus. The next morning, the girls not only missed the bus, they failed to show up (metaphorically) until late in the morning! We coaches completely rigged the boat, sorted the food, water and made sure that all were off the dock timely. The 4th SATT leg was a really nice sail, and by late morning when our Omani girls started to wake up, they got into it – but it took a lot of time. The finish was hard fought, with the Dutch. We had been fighting them the entire way, and were literally only meters off their stern as we came towards the finish line. Although we faked them out with a fake gybe to break away, they had the favored side of the course, and just beat us. It was a nice day. The race from Dubai to RAK was meant to start at 10:00 am in the morning, in order to have raced in daylight – which as it turns out, would have been a dramatically better situation. Due to a complete fiasco with customs, we were delayed on shore until 1:30 am. This caused us to get into RAK at midnight, with an immediate turn-around in the morning to head to the boats for in-port racing! UGH. However, being tired ended up the least of our concerns, because it turned out the leg was covered in huge swaths of gill nets – most portions unlit with occasional flashers, and fisherman flashing lights at us at one end (if you were lucky). If you check the tracker you will see that our fleet would be moving along, and then be brought to a shuddering halt. This caused some to wipeout, from going downwind, and then becoming mired in the fishing nets. Some got off, some did not, and required fisherman to help, or sailors to jump in to try to clear the nets (dangerous). We were in fifth at the first waypoint, but after dodging a few nets, our time was up. We ended up firmly stuck in a huge net for over an hour. As competitors sailed away, I contemplated jumping in, but there were fisherman coming, so I decided to wait. The girls handled the wipeouts and craziness well – and negotiated help from the fisherman in arabic, which was handy. Eventually, we got going, and it was us and the Dutch again, heading toward the finish. But this time the wind died, and we didn’t make the time limit. So frustrating, and we didn’t get to the hotel until 1:00 am. Double UGH.